If you are planning a vacation to Cancun, Riviera Maya, or other regional vacation destinations in the Mexican Caribbean, you may not realize that in addition to all of the gorgeous beaches and fun water sports, the Yucatan Peninsula is home to a gorgeous lush jungle interior. You will have the opportunity to explore the winding forest trails that twist and turn, crossing back country rivers, and discovering remote caverns and refreshing cenotes. Cenotes, flooded freshwater caverns that appear as lagoons on the surface, are unique to this area of Mexico. You will discover a wondrous world of verdant vegetation, blooming flowers, singing tropical birds, and other indigenous wildlife. If you are a nature lover, there is no better way to gain access to the wilds of the Yucatan interior than on one of our late model all terrain vehicles. Even if you are not as interested in wildlife, but are interested in an outdoor activity that will get your adrenaline pumping, there is nothing more exhilarating than zooming along a snaking jungle trail on an ATV. We only use the latest four-wheelers, rally buggies, amphibious vehicles, Polaris ATVs, and Ranger RZRs. All of our vehicles are meticulously maintained and kept in prime working order by our maintenance staff. Our safety-oriented guides will ensure that you enjoy a safe and fun-filled adventure tour in the beautiful back country. Even if you have never driven an ATV, our patient English-fluent guides can teach you how to ride quickly. We offer various types of ATV adventures in combination with other outdoor activities like zip-lining, and cenote swimming. Think the sky's the limit? You're wrong and this off-road/flight challenge is proof. Imagine not one, not two, not three but SIX amazing adventures in one package! Zip through a series of breathtaking flight lines, cool off in a cenote, and rumble through the jungle on your Polaris Ranger RZR. Have a blast on this combination tour that brings you right into the heart of the jungle. Zip through a forest canopy, drive your own ATV through the jungle, and splash about in a refreshing cenote. This tour offers the best of the jungle on your trip to Cancun. 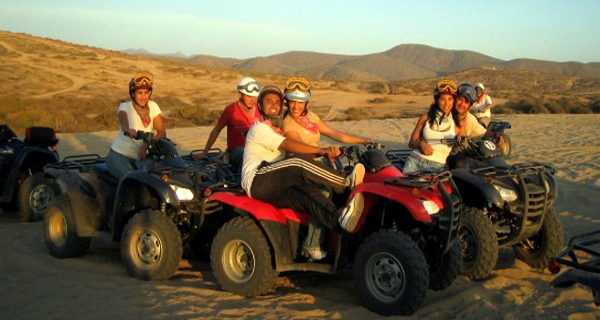 Enjoy an exciting off road thrill ride while driving one of our powerful ATVs. Zoom along rocky trails, muddy jungle paths, and fun ramps on our back country challenge course.